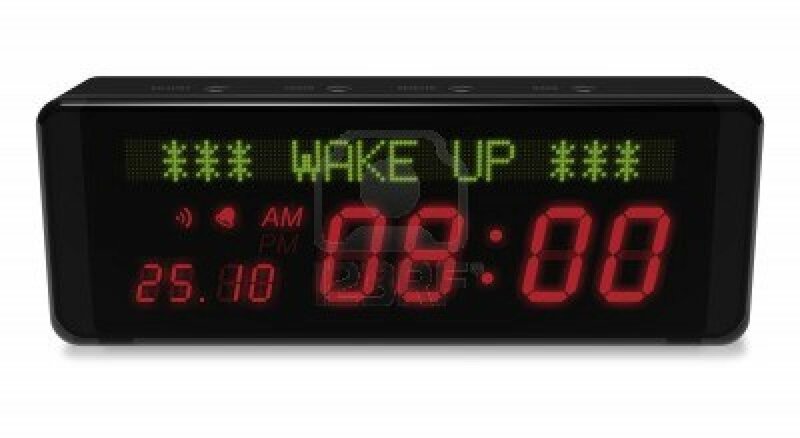 Put your alarm clock in someone else’s room. Set at full volume. Get a cat. Do not feed it for at least 24 hours. Just before bedtime, drink a cup of hot, soothing Smooth Move Chocolate Tea. Steep 6 bags at once, covered, for 15 minutes. Have your friends rewire your Roomba to malfunction and catch on fire at the desired wake-up time. Set the timer on your TV so that the menu music for the “Pirates of the Caribbean” DVD runs over and over for a full 8 minutes. Place cold brew coffee at your bedside. Let it get nice and lukewarm overnight. Reach for it just as soon as your alarm goes off. Knock it over all over your bed, your phone, and your person. Immediately call in sick to work upon alarm sounding. Create a rewarding morning ritual to look forward to, such as playing “Life is a Highway” by Tom Cochrane on the flute upon waking. Wait until the rogue alarm on your old sports watch goes off instead. Keep things fresh and confusing for your biological clock in other ways, such as skipping birth control pills for 5 days and then taking taking them all on the 6th day.